Retirement Wishes for Boss: Write an inspirational quote on a greeting card to say goodbye to a boss who is leaving the office. If you are going to give a farewell speech or write a short letter, take ideas from these messages to say something sweet. If all your colleagues shared a good bond, barrage your boss’ Facebook and Pinterest with funny one-liners about retiring and getting old. If you’ve always had an overtly formal relationship with your boss, a handwritten note should suffice to give your best wishes. Your boss may have been a tough manager but the only reason for his annoyingly angry personality was to pay the mortgage, pay the bills and put food on the table – just like everyone else. 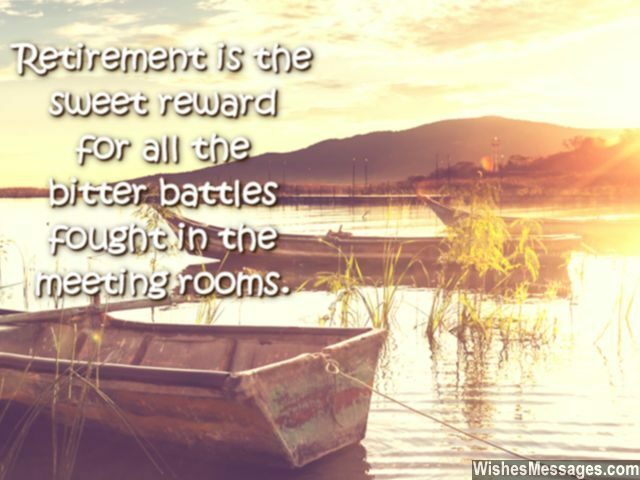 1) Retirement is the sweet reward for all the bitter battles fought in the boardroom. Congratulations. 2) Boss… as you prepare to pack up and retire today, we confess that we enjoyed annoying you in every possible way. 3) It always hurts to lose that one best person, who leads the pack at work and gets everything done. The person who moves ahead and takes everyone else along, who builds a winning team by making everyone strong. Farewell, boss. 4) Your retirement is a just an illusion. Your spouse will become your new boss and your grandchildren become your full time colleagues. Happy retirement. 5) Retirement is life’s way of telling you that it is time you put your friends and family before your work. Happy retirement. 6) Congratulations for retiring. Life has officially given you the permission to splurge, enjoy and relax. 7) We wish your birthdays never came, we wish you never grew old. We wish that as the years flew by, you’d gotten young and bold. We wish time had gone in reverse, making you younger by the day. Boss… you’ll be missed, is what we want to say. Goodbye. 8) Retirement marks the time when your dress code officially changes from shirts and suits to flannels and jammies. Enjoy! 9) Retirement is life’s greatest tease. You have more free time than a thirteen year old but your energy levels are worse than a fifty year old. 10) All these years you may have been the boss, but now all that goes out for a toss. Retirement marks the end of your reigning thunder, because without your job title you’re no more than a mere commoner. Farewell. 11) Dear boss… please remember that no matter how much everyone wishes you well for your retirement, deep down inside they’re just happy that you’re leaving. Farewell. 12) In terms of profit and loss, your retirement is a loss for your colleagues and a profit for your family. Farewell. 13) Boss… retirement is a sweet vacation. Don’t set yourself targets at home too. Farewell. 14) The first week of retirement will feel like the first taste of freedom. The second week of retirement will feel like a vacation. The third week of retirement will feel like the beginning of lifelong captivity at home. Happy retirement boss. 15) Throughout your career you have been someone’s boss. Retirement is your chance to be your own. Congratulations. 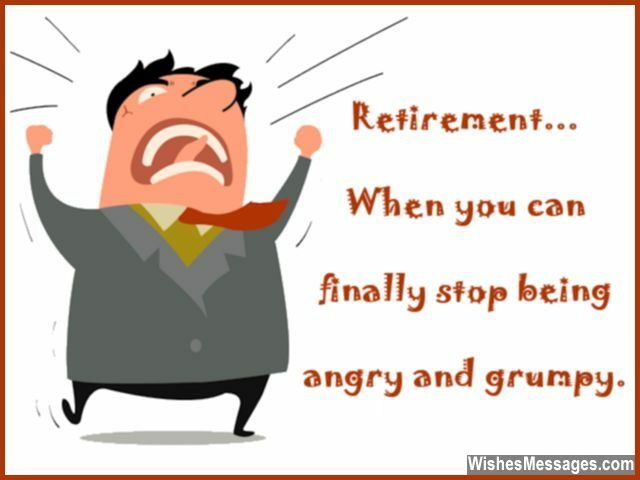 16) Boss… retirement is when you can finally stop being angry and grumpy. Congratulations. 17) Retirement signals the time when you’ve had your fair share of time spent with annoying colleagues. Now it’s time to move over to annoying family members. Good luck. 18) You may be given retirement because you are growing old. But it is a pity the company doesn’t realize that it is letting go of an asset more precious than gold. Happy retirement boss. 19) Your career’s biggest souvenirs are your colleagues’ good wishes. Happy retirement. 20) Dear boss… retirement is life’s way of telling you that you’ve spent too much time giving orders and getting others to do things for you. Now it’s time to do something on your own. 21) Most managers hate to retire. Because without a staff, it marks the pivotal point when they actually have to start doing all their work themselves. 22) Boss… thanks for pulling me up, whenever it was needed. I’m glad that it was, your precious advice that I heeded. Thanks for pulling me down, when I was flying too high. If not for you, I’d had enough reasons to sigh. Goodbye. 23) You may have accomplished many challenges so far… but the biggest challenge of your retired life is about to begin – finding something challenging to do. Good luck. 24) Your retirement is nothing short of a glorious achievement. Not every leader can retire with such grace, dignity, respect and a teary eyed farewell from the whole office. Congratulations boss. 25) All your work life you’ve given orders to colleagues. Now you’ll experience how it feels to have a boss… as you stay home and take orders from your wife. Happy retirement. 26) I think you will love retirement. You never took day-offs from work… and there are no day-offs in retirement either. Happy retirement boss. 27) Until now you may have thought that life’s biggest battles are fought in the boardroom… but now as you retire and spend more time at home, you’ll realize that they’re actually fought in the kitchen. Good luck. 28) You were a good boss because more than instructions, you gave us direction and inspiration. Happy retirement. 29) We will be happy if we can be even half as efficient, half as creative and half as amazing as a team as compared to what we were when you were the boss. Farewell. 30) You have always laid all the rules in the office. Now you will finally be on the other side as your wife lays all the rules at home. Wish you a happy retirement! 31) Until now you worried frantically about reports and company balance sheets… but in old age you’ll have to worry about not wetting your own sheets. Happy retirement boss. 32) We never had a dull moment or a slow day in the office when you were around. Even though you were the eldest, your spirit was the youngest. Goodbye. 33) How we wish that you were born a few years later so that we would have some more time to work under the guidance of an awesome boss like you. Happy retirement. 34) I wish you a happy retirement not because I empathize with your age, but because I am inspired by the terrific career you’ve had and life you have lived so far. Good luck. 35) No matter how grumpy and annoying you may have been at the outset, deep down inside all your colleagues know that you did it in the best interests of the company… or did you? Happy retirement boss. 36) Your retirement may be the end of your desk job, but it marks the beginning of many new jobs like being a cook and helping your wife in the kitchen, being a cleaner and cleaning the house, and being a nanny and watching the grandkids. Good luck. 37) You will be remembered for how you always smiled even when things weren’t going so well… you never let your colleagues suffer even when on other problems, you had to dwell. Goodbye. 38) Throughout your career you were busy climbing up the corporate ladder. Retirement is the time to stop climbing and put your feet up as you sit back on the sofa. Enjoy. 39) If I got a few wishes, I’d ask for all your abilities. My dream come true, would be to have all your capabilities. Wish you the best on your retirement. 40) Boss… I’m glad that you’re finally retiring. Now I’ll be able to tell you anything I want to without worrying about getting sacked. Good luck.